This cap of closely knitted wool was probably originally black. The crown is flat and knitted to shape. The brim is deeper at the back than the front, and is cut so as to form four lappets ('ears'). These have a raw edge, ie they have not been finished off with stitching or hemming. The cap probably had a felted finish which it has lost. Typically, knitting ladders when the wool is broken, but here it has not. Knitted or felted caps were designed to be warm and waterproof. Some protected the neck, some had ear flaps, and many were trimmed with ribbons to imitate expensive silk versions. Wealthy Londoners would have worn European fashionable bonnets or caps of silk velvet decorated with ostrich feathers, aglets (jewelled pins) and brooches. Knitted caps were heavily felted so their surface texture imitated velvet. Wool absorbs colour easily, so many caps were dyed in strong colours, such as red and black, which were fashionable at the time. 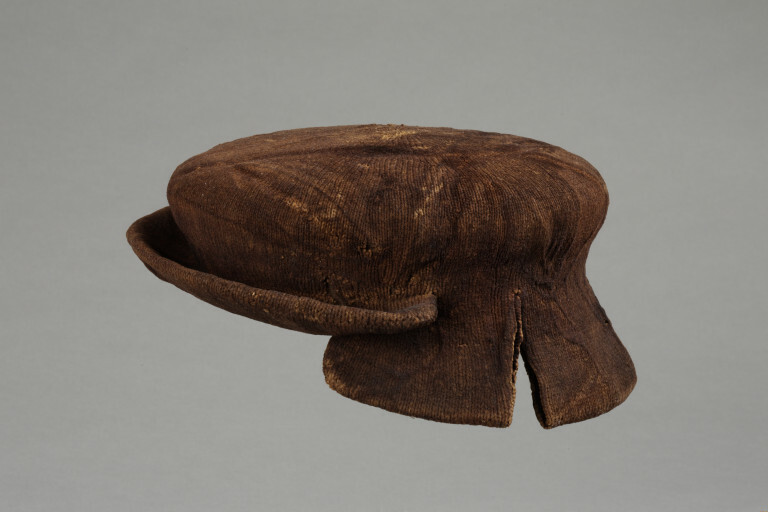 A large number of 16th-century knitted caps, most of highly fashionable shape, were discovered in Greater London in the early 20th century during building works. The context of the finds and the fact that the caps themselves were knitted suggest that they were not intended for the upper strata of society, but rather for the middle classes. Cap of closely knitted wool, now purplish-brown in colour but probably originally black. The crown is flat and knitted to shape with a brim all round; the brim is deeper at the back than the front, and is cut so as to form four lappets. These lappets have a raw edge, they have been cut but not finished off with stitching or hemming. The cap probably had a felted finish which it has lost. 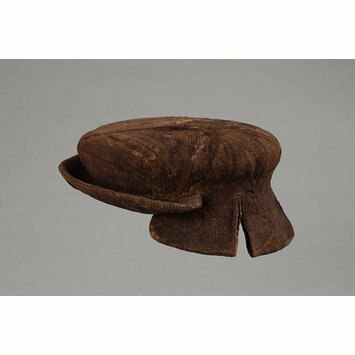 This cap came to the V&A through Mr George F Lawrence, among other caps and lots of Medieval and Tudor shoes. He was an antiquary, collector and dealer in antiquities. He supplied thousands of finds from prehistoric to Tudor London to many museums, including the Guildhall and London Museums. He was employed by both museums at different times. He not only 'personally' extracted from excavations and building sites but also bought from the workmen and then sold them to private collectors and museums all over England. The history of this cap has altered its physical state. The fact that very few stitches have laddered despite the raw edges left round the brim suggests that it may originally have been heavily felted. Felting prevents laddering of knitted items. Historical significance: In England, the manufacture of caps was of sufficient importance to merit control by Act of Parliament from 1488 onwards. The 'Cappers Act' of 1571 stated that every person above the age of six years (excepting 'Maids, ladies, gentlewomen, noble personages, and every Lord, knight and gentleman of twenty marks land') residing in any of the cities, towns, villages or hamlets of England, shall wear on Sundays and holidays (except when travelling), 'a cap of wool, thicked and dressed in England, made within this realm, and only dressed and finished by some of the trade of cappers, upon pain to forfeit for every day of not wearing 3s. 4d.'. This act was intended to keep domestic production alive, as caps were outmoded by this date and there was a danger that a fall in demand for them would have a detrimental effect on the makers. (From Statutes at Large, vol vi, p 288, quoted in Textile History, vol 1, 1971; article by S M Levey: Illustrations of the History of Knitting Selected from the Collection of the Victoria and Albert Museum). Knitted or felted caps were designed to be warm and waterproof, some protected the neck, some had ear flaps and many were trimmed with ribbons to imitate expensive silk versions. Wealthy Londoners would have worn European fashionable bonnets / caps of silk velvet decorated with ostrich feathers, aglets and brooches. Knitted caps were heavily felted so that their surface texture imitated velvet. Wool absorbs colour easily, so many caps were dyed in strong colours, such as red and black, which were fashionable at the time. A large number of 16th-century knitted caps, most of highly fashionable shape, have been discovered in Greater London in the early 20th century during building works. Many of the caps and other knitted objects are in the Museum of London. The context/location of the find and the fact that the caps themselves were knitted suggest that they were not intended for the upper strata of society, but rather for the middle classes. Knitted woollen cap with brim and lappets at the back, London, early 16th century.